CBS has SHUT DOWN fans creating a free VIRTUAL REALITY Enterprise-D Walk-Through! One of the most mind-blowingly exciting and immersive fan projects EVER has just received a Cease and Desist letter from CBS. And I’m not just speaking in hyperbole here. The STAGE 9 project was virtually (pun intended) guaranteed to get an “OMG…I can’t believe this exists!” from Trekkies who discovered it. It wasn’t a fan film but rather a virtual reality recreation of the USS Enterprise NCC-1701-D…not just from the outside but also from the inside! What began back in 2016 as just a simple art project by a Trek fan in the UK trying to make a really nice 3D recreation of the TNG bridge quickly grew to so much more! Using the fourth iteration of the Unreal Engine from Epic Games, an open-source way for anyone to design and build their own virtual reality simulations for first-person shooters and the such, a number of developers from around the world hopped on board with this U.K. artist to improve and expand what the newly-dubbed “Stage 9” project had to offer. 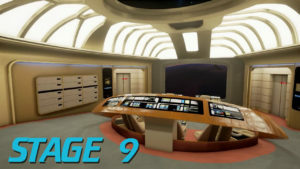 New version by new version, more decks and destinations were added to the virtual walk-through: the observation lounge, Picard’s ready room, the hangar deck (a very BIG hangar deck! ), sickbay, transporter rooms, battle bridge, Picard’s quarters (with Ressikan flute! ), Data’s quarters, Worf’s quarters, engineering, ten forward, nine forward, other crew lounges, flight deck control operations, the arboretum, the brig, science labs, computer core, holodecks, phaser range, and endless corridors. Author Jonathan LanePosted on September 26, 2018 September 26, 2018 Categories NewsTags CBS, Rob Bryan, Stage 9 Enterprise44 Comments on CBS has SHUT DOWN fans creating a free VIRTUAL REALITY Enterprise-D Walk-Through!